The Crew 2 races (and flies, and sails) onto the scene next month, and Ubisoft has revealed what kind of rig you’ll need to play the game. The requirements are surprisingly modest, with even the recommended 1080p 60 fps at high settings configuration only requiring an Intel Core i5, 8 GB of RAM, and GeForce GTX 970 graphics card. Not a terribly high barrier to entry for a triple-A game from a major publisher. Screen resolution selection with multi-aspect ratio support, including 21/9 screens. Geometry: Set the view distance details. Shadows: Set the resolution and quality of all shadows in the game. Textures: Set the quality of in-game textures. Game restart is required to apply changes. Environment Mapping: Set the quality and the resolution of real-time reflection and indirect lighting. Depth of field: Set the depth of field quality. Motion Blur: Set the strength and quality of in-game Motion Blur while moving. A disable feature also is available. Grass: Set the density of grass in the game environments. Volumetric FX: Set quality of clouds and fog. Anti-aliasing: Set the quality of edge sharpening and overall graphic fidelity. Ambient occlusion: Set details of shadows based on two or more intersecting objects. Screen space reflection: SSR allows even more improvements to Environment Mapping by using some parts of the rendered image if possible. The player can choose SSR quality or disable it for low-end machines. Weather: Set the quality of weather effects in the game. Terrain: Terrain quality settings can allow more details in medium and far view. 3-Monitor FOV scale factor: If the player uses a 3-monitor configuration, this value allows them to adjust the focus level of the monitor in the middle and corrects potential FOV deformation because of the unusual aspect ratio. 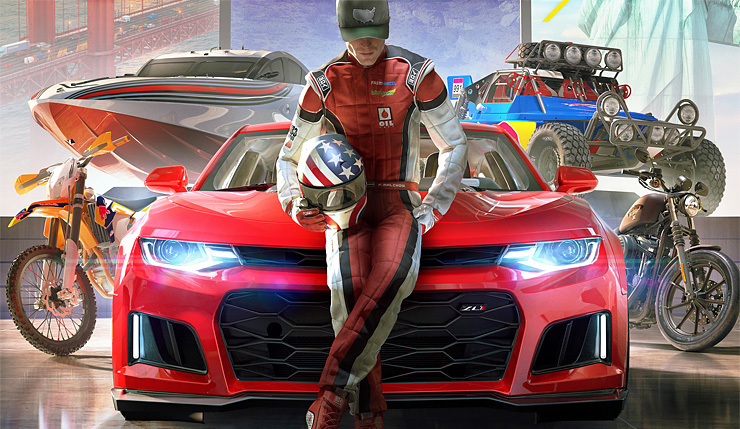 In The Crew 2, take on the American motorsports scene as you explore and dominate the land, air, and sea of the United States in one of the most exhilarating open worlds ever created. With a wide variety of exotic cars, bikes, boats, and planes to choose from, experience excitement of competing across the entire US as you test your skills in a wide range of driving disciplines. Fame is yours to take! The Crew 2 drifts onto PC, Xbox One, and PS4 on June 29.